A partner in the firm, Pamela concentrates her practice in the areas of sophisticated trust and estate planning, estate administration, and residential and commercial real estate transactions. As part of her probate and estate planning practice, she provides advice and guidance to elders and their families in the areas of long-term care planning, conservatorship, and guardianship. Pamela believes strongly in providing compassionate, thorough advice to clients coping with the long-term illness of a loved one, or loss of a family member. Pamela also enjoys working with first-time home buyers, and people looking to buy or build their dream homes. 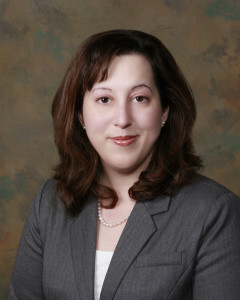 Pamela served as Managing Editor of the Law Review at Western New England College School of Law and earned her bachelor’s and master’s degrees in World Politics from The Catholic University of America. In 2013, 2014, and 2015, Pamela was named to Boston Magazine’s “Massachusetts Super Lawyers Rising Stars” list, an honor limited to no more than 2.5% of the attorneys practicing in the state. Pamela has co-authored two book chapters with Virginia Stanton Smith for Massachusetts Continuing Legal Education, Inc., including a chapter on “Deeds of Fiduciaries” in the venerated real estate treatise Crocker’s Notes on Common Forms, which has been in continuous publication since 1883. They also co-authored “Devolution of Title by Death and by Incompetents” in Real Estate Title Practice in Massachusetts. While in law school, Pamela published an article on interstate wine shipments entitled “The Grape March on Washington: The 21st Amendment, the Dormant Commerce Clause, and Direct Alcohol Shipments” 26 W. NEW ENG. L. REV. 343 (2004). She has also made numerous presentations on long-term care issues, estate planning, and probate matters for several local organizations, and has written several articles on those topics for Berkshire Senior. Pamela and her husband have chosen to make their home in Pittsfield, Massachusetts, since 2005. They both love living in the Berkshires, and have become active volunteers with the Berkshire Scenic Railway Museum, where they can indulge their love of trains and history. Pamela volunteers her time as the museum’s General Counsel and Special Events Manager. Pamela is a member of the Board of Directors of Berkshire Taconic Community Foundation. She has also been a member of the Pittsfield Economic Development Authority (PEDA) Board of Directors since 2012, the Hancock Shaker Village Audit Committee since 2014, and was named as Director of the Estate Planning Council of Berkshire County in 2016. In 2016, Pamela was in the inaugural class of the Berkshire County 40 Under Forty award recipients for her professional achievements and community involvement.